As a child Jeanette was always drawing, stitching or doing something creative and her Mum taught her to hand knit at the age of 7. Her fascination with yarn, texture and colour led her to study for a degree in textile design where Jeanette specialised in hand and machine knitting, learning to crochet, bead and embroider along the academic journey. Colour is very important to Jeanette and her design process often begins with a search for an intriguing stitch that will inspire creative juices to flow or a decorative detail that will add a stylish, contemporary edge. Jeanette has worked as a freelance textile designer and tutor teaching both machine and hand knitting and as an accessories aficionado has written 4 books on hand knitting. Much lauded in the Industry Jeanette is consulted by some of the best hand knitting brands in the UK and her designs are commissioned in several UK knitting magazines including The Knitter, and Knitting Magazine where she is a regular contributor responsible for the ‘Ask Jeanette’ letters page, Yarn Reviews and A-Z of Techniques. In 2016 Jeanette was diagnosed with two brain tumours which led to her seriously re-evaluating her work life balance; she is now thankfully recovered she made the decision to devote more of her professional time working on her SLOANmade label. 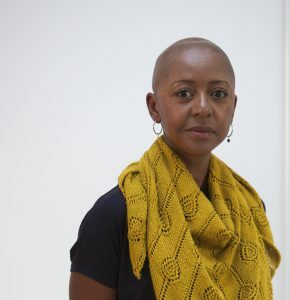 In August 2018 – before the current wave of discussion on Instagram about racism in the global knitting and fibre communities – Jeanette wanted to challenge the statement that ‘black people don’t knit – they crochet’ which formed the basis of academic Lorna Hamilton Brown’s dissertation ‘Myth: Black People Don’t Knit – the importance of art and oral histories for documenting the experiences of black knitters’ and founded the POC (People of Colour) Designers and Crafters List which is published on her website. Jeanette Sloan will deliver our 2019 Keynote Lecture: ‘BIPOC and the need for representation in the Knitting Community’ at 1:15pm on 7 September at the Dewars Centre.